What is it about fall that is so alluring? Perhaps it’s the nostalgia of past autumn days spent raking and jumping in the leaves, pulling out the cozy sweaters and winter hats after a warm summer, smelling and savoring fresh baked apple and pumpkin pies, or cheering on our favorite football teams amidst family and friends. There are so many activities, sounds, and scents that we associate with this delightful season. One favorite activity that literally beckons people from all over the globe is enjoying the fall foliage. Whether on foot or by car, millions will get out to view the trees as their leaves change from rich summer greens to vibrant autumn hues. Did you know that Pennsylvania has a longer and more diverse fall foliage season than any other state in the nation, or anywhere in the world for that matter? Seriously, Pennsylvania is the place to be this fall! Our magnificent mountains will start turning colors in late September or early October. 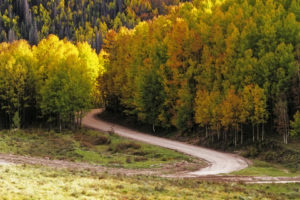 By mid- to late-October, the surrounding valleys and mountains will be singing with an explosion of color, from golden yellow and burnt orange, to rich red and many variations in between. One exceptional place to view the brilliant fall foliage is right here in Carlisle, PA, a wonderful town nestled in the magnificent Cumberland Valley. Here are a few places to view the profusion of color, the height of which occurs in mid-to late-October. Waggoner’s Gap Hawk Watch – Just north of Carlisle, this 20-acre hawk watching site not only inhabits the largest concentration of raptors in the US, it also offers breathtaking views of the Valley. Just imagine watching the regal golden eagle as it soars through the crisp blue sky over countless trees exploding in color! 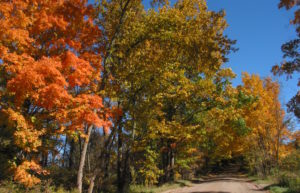 Colonel Denning State Park – This park offers sightseers, hikers, and nature photographers a wonderful place to take in the fall foliage! Here you will find 273-acres of wooded park, a 3-½-acre scenic lake and excellent hiking trails. For those looking for a challenging hike, try the 2.5-mile trail to Flat Rock where you’ll be rewarded with an outlook offering stunning views of the Cumberland Valley! Kings Gap State Park – This is Cumberland Valley’s largest park with scenic views and many hiking trails. As you climb the winding mountain to Kings Gap, be sure to stop at the pull-offs to take in the fantastic Valley views. Michaux State Forest and Pine Grove Furnace State Park – Here you will enjoy a scenic drive through the South Mountain Region of Pennsylvania, the Appalachian Trail, and the Pole Steeple Overlook. Make sure you have your camera so you can capture the beauty of brilliant fall foliage reflecting in the two lakes. So, what are you waiting for? Now is the time to pack your bags and head to the Cumberland Valley for an enjoyable fall getaway! Book your fall getaway at our charming bed and breakfast located right in the heart of downtown Carlisle! The Carlisle House will pamper you with a delicious homemade breakfast each morning, comfortable guest rooms for a good night’s sleep, warm hospitality, and wonderful guest amenities. Need help planning your trip? Contact us today and we’ll help you plan a getaway to remember! 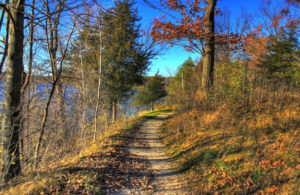 This entry was posted in Fall Events and tagged fall foliage, hiking by acorn. Bookmark the permalink.